quick: a couple of keystrokes is often enough to select an item. But how do you manage the items in the list? Access gives several options. When you enter something that is not in the combo's list, its Not In List event fires. Use this event to add the new item to the RowSource table. This solution is best for simple lists where there is only one field, such as choosing a category. You must set the combo's Limit To List property to Yes, or the Limit To List event won't fire. 'Get confirmation that this is not just a spelling error. strTmp = "Add '" & NewData & "' as a new product category?" 'Append the NewData as a record in the Categories table. "SELECT """ & NewData & """ AS CategoryName;"
'Notify Access about the new record, so it requeries the combo. This approach can add new items only. It cannot delete or correct items in the list. Be careful if the combo's RowSource contains criteria. The table may already have the NewData, in which case the attempt to append it will fail. 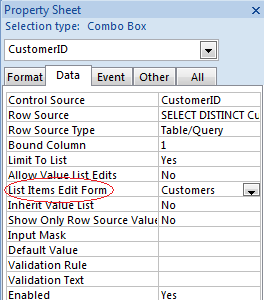 If the combo's source table has several fields, you need a form. Access 2007 gave combos a new property to make this very easy. Just set this property to the name of the form that should be used to manage the items in the combo's list. This approach is very simple, and requires no code. The example below is for a CustomerID combo on an order form. When filling out an order, you can right-click the combo to add a new customer. Previous versions of Access cannot do this. The form is opened modally (dialog mode), so you cannot browse elsewhere to decide what to add. To avoid these limitations, you could choose another event to pop up the form to edit the list. Perhaps the combo's DblClick event, a custom shortcut menu, or the click of a command button beside the combo. This approach does require some programming. There are several issues to solve here, since the edit form may already be open. 'Set up to search for the current customer. strWhere = "CustomerID = """ & Me.CustomerID & """"
'Save any edits in progress, and make it the active form. 'Find the record matching the combo. 'Combo was blank, so go to new record. 'Undo the combo if it has a partially entered value. Set the combo's Limit To List property to No, and it lets you enter values values that are not in the list. This approach is suitable for free-form text fields where the value might be similar to other records, but could also be quite different. For example, a comments field where comments might be similar to another record, but could be completely different. The auto-expand makes it quick to enter similar comments, but it gives no accuracy. It is unnormalized, and completely unsuitable if you might need to count or group by the lookup category. If the combo's bound column is not the display column, you cannot set Limit To List to No. Anything you type in the combo is saved in the Comments field. The list automatically shows the current items next time you open the form. This approach is useful in only very limited scenarios. In a word, DON'T! No serious developer should let users add items to value lists, despite Access 2007 introducing a raft of new properties for this purpose. If you set a combo's Row Source Type to Value List, you can enter the list of items (separated by semicolons) in the Row Source. You might do this for a very limited range of choices that will never change (e.g. "Male"; "Female.") But letting the user add items to the list almost guarantees you will end up with bad data. 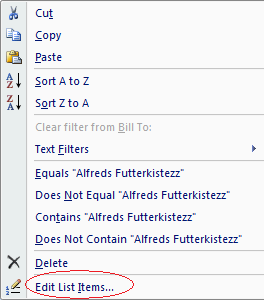 Access 2007 introduced the Allow Value List Edits property. If you set this to Yes, you can right-click the combo and choose Edit List Items in the shortcut menu. Access opens a dialog where you can add items, remove items, or edit the items in the list. You can remove items that are actually being used in other records. You can correct a misspelled item, but the records that already have the misspelled item are not corrected. You can add items to your form, but in a split database, other users don't get these items. Consequently, other users add items with other names to their forms, even where they should be the same item. Do you want to save the changes to the design of the form? If you answer No after using one of the new items, you now have items in the data that don't match the list. If you answer Yes in an unsplit database, you introduce strange errors as multiple users attempt to modify objects that could be in use by other people. If you answer Yes in an split database, the list of items in one front end no longer matches the lists in the others. Your changes don't last anyway: they are lost when the front end is updated. There is no safe, reliable way for users to add items to the Value List in the form without messing up the integrity of the data. What about storing the value list in the table instead of the form? Access 2007 and later can do that, but again it's unusable. Don't do it! Some developers hate the idea of a combo in a table anyway. Particularly if the Bound Column is not the display value, it confuses people by masking what is really stored there, not to mention the issues with the wizard that creates this. For details, see The Evils of Lookup Fields in Tables. But lets ignore this wisdom, and explore what happens of you store the value list in the table. Row Source "dog"; "cat"; "fish"
Now create a form using this table, with a combo for this field. Set the combo's Inherit Value List property to Yes. Now Access ignores the Row Source list in the form, and uses the list from the table instead. If you edit the list (adding, deleting, or modifying items), Access stores the changes in the properties of the field in the table. Does this solve the problems associated with keeping the list in the form? No, it does not. If the database is split (so the table is attached), the changed Value List is updated in the linked table in the front end only. It is not written to the real table in the back end. Consequently, the changed Value List is not propagated to other users. We still have the same problem where each user is adding their own separate items to the list. And we have the same problem where the user's changes are lost when the front end is updated. At this point, it seems pointless to continue testing. One can also imagine multi-user issues with people overwriting each others' entries as they edit the data if the database is not split. 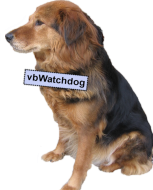 There is no safe, reliable way for users to add items to the Value List without messing up the integrity of the data. Multi-valued fields (MVFs - introduced in Access 2007), suffer from the same issues if you let users edit their value list. Use tables, not value lists, to manage lookup data. Create relationships with Relational Integrity. Use these lookup tables (or queries based on them), as the RowSource for your combos. Do not use Value Lists for anything more than the simplest of choices that the user never needs to edit. Use the Not In List event to add data to simple, single-field lookups such as types or categories. If you only use Access 2007 or later, the List Items Edit Form property is a quick and easy way to nominate the form to use for managing the list items. To edit the list in any version of Access, or to control how the editing works, use another event such as the combo's DblClick. What did you think of 'NotInList: Adding values to lookup tables'?